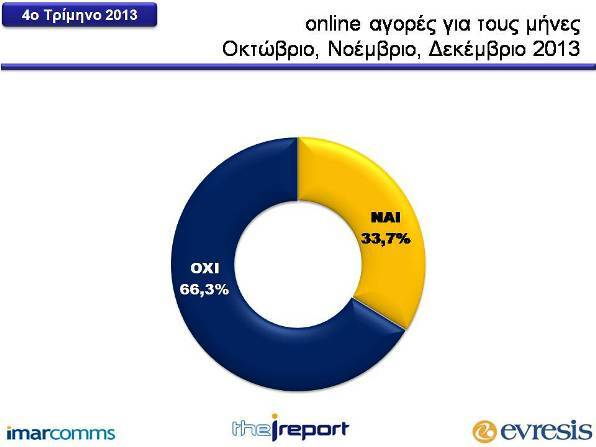 The results of the fourth quarter of 2013 of the subscription tool for measuring and analyzing online shopping in Cyprus - the I Report – were announced today by Evresis Research and Interactive Marketing Services Company, ImarComms. I Report recorded the online behavior of the Cypriot consumer for the fourth quarter of 2013 with December reaching 61.6%, recording the highest buying traffic in comparison to other months of the year. Buying traffic for October and November was recorded at 42.6 % and 39 % respectively. In general, online purchases increased by 0.8 % in comparison to the previous quarter of 2013, reaching 33.7% despite the ongoing economic recession. I Report recorded a constant increase in the usage of mobile phone devices for online purchases, reaching 18.4 % of the total online purchases in the fourth quarter of 2013, while continuous increase was recorded on purchases made via Tablet, reaching 9.5 %. The percentage of the online purchases that were performed via computer decreased to 86.6%. Also, 92.5 % of online purchases were made from home and 11.1 % from the office. "The results of the fourth quarter of 2013 show a significant momentum mainly due to December that despite the market instability it kept online shopping on the rise," said Nicholas Nicholaou, Director of Evresis. Regarding the categories and types of products purchased online, I Report recorded: As first the ‘Clothing Category’ with 46.5 % and an increase of 3 %, with sportswear to grow at 61.3 % and work clothes reduced to 54.1 %. As second, the ‘Footwear Category’ with 22.8 % and an increase of 11.4 %. As third the ‘Cosmetics Category’ with 18.7 % and an increase of 2.5 %. As fourth the ‘Mobile Phone Devices Category’ with 16.2 % and a decrease of 2.3 %. For the websites and online shops from where the purchases were made, I Report recorded Ebay remaining first with 59.3 % and an increase of 3.3 %, as second followed Amazon with 29% and an increase of 1.2 %, and as third Asos with 17 % and an increase of 1.1 %. Strawberrynet follows with 6.7 % and Cyprus Airways with 5.8 %. Also from other online shops, I Report recorded amongst the Top Ten - Feel Unique with 5.6 %, and Net A Porter with 5 %. "At the most important period of the year for online shopping, I Report recorded a change in the selection of goods that have the most demand, with Clothing and Footwear Categories to overcome Technology products and even Cosmetics to exceed Travel and Books, showing the general preference tending towards the highly necessary and affordable goods." said Pericles Ellinas, CEO of ImarComms.